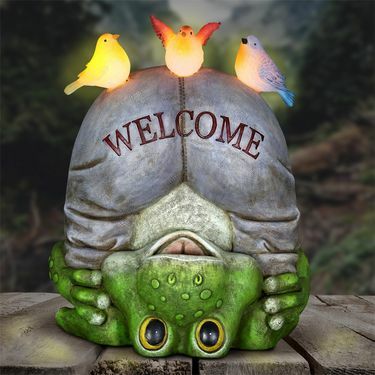 A glowing Topsy-Turvy Solar Welcome Frog greets you and all your guests into your garden day or night. At dusk, the solar powered LED light will automatically illuminate this adorable garden statuary. Cheerful little birds add a whimsical touch. Solar powered LED light provides an enchanting glow at dusk! Made of durable resin, UV treated to resist fading. Size: 6.75" x 8.75" x 10.25"H., approx. 3.5 lbs.